NAM’s tri-annual gathering is attended by leaders of 120 developing nations – including India, Pakistan, and Lebanon – and represents the largest single voting bloc in the UN General Assembly. The summit, which concludes on Friday, is viewed as a chance for Iran to assert a degree of authority it is never granted by Western countries. 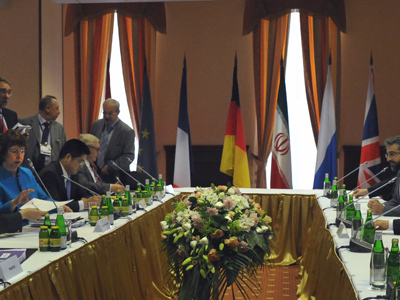 But Thursday’s events saw Tehran embroiled in controversies with both the UN and Egypt. "The UN Security Council has an irrational, unjust and utterly undemocratic structure, and this is an overt dictatorship," Ayatollah Ali Khamenei said. The remarks came just one day after the UN chief told Iranian leaders to take steps to prove the country’s nuclear program is peaceful. Ban attended the summit despite calls from the US and Israel to boycott the event, and his attendance is widely viewed as a blow to Western efforts to isolate Tehran. In his speech, Khamenei insisted that Iran is “never seeking nuclear weapons,” and that his country considers them "a big and unforgivable sin." He also accused the UN of submitting to pressure from the Security Council’s permanent Western members – the US, UK and France – in its stance on Tehran’s nuclear program. 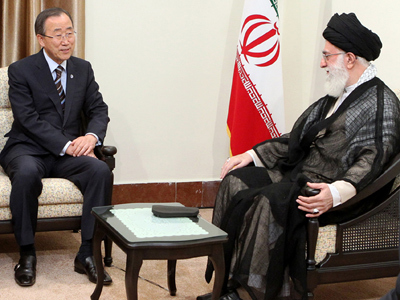 The dramatic remarks put pressure on the already tense relationship between Iran and the UN. Tehran is currently at loggerheads with the UN over its nuclear program, which has resulted in four rounds of sanctions being imposed by Security Council resolutions. The dueling speeches by Iran and the UN weren’t the only issues of contention at the NAM summit – the ongoing crisis in Syria was also a hotly debated topic. Egyptian President Mohammed Morsi criticized Syrian President Bashar Al-Assad's "oppressive" regime in a speech, saying that the world should support the Syrian rebels. The remark prompted members of the Syrian delegation to walk out of the room. Syrian Foreign Minister Walid Moallem denounced the statement, saying it was an "intereference in Syria's internal affairs" and instigated the "continuing shedding of Syrian blood." Morsi’s statement clearly contradicts the views of Iran’s leaders, who have backed Assad since the uprisings began in the country last year.